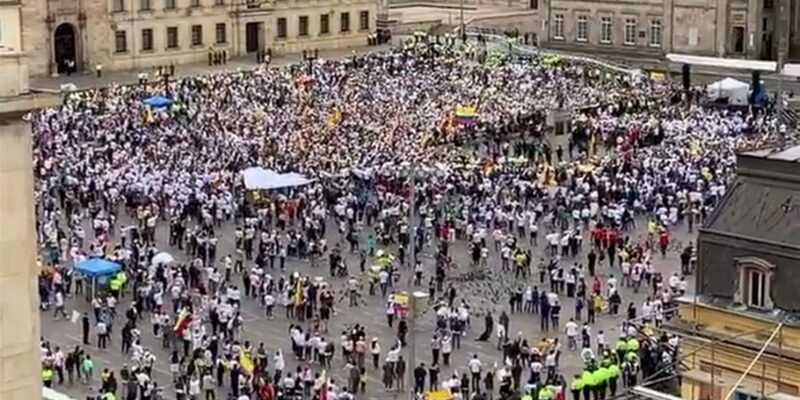 Thousands of Colombians hit the streets on Sunday to march against terrorism while many stayed in to protest against President Ivan Duque‘s decision to end peace talks with ELN rebels. A terrorist attack that took 21 lives in Bogota on Thursday and Duque’s subsequent announcement he would end the peace talks with the guerrillas he blames for the attack have deepened divisions in Colombian society. The divisions caused tensions in Bogota and Medellin between supporters of the president and anti-war activists taking part in the march. Former President and Nobel Peace Prize laureate Juan Manuel Santos was booed by supporters of his political rival, controversial former President Alvaro Uribe, in the capital. Many stayed home after stating on social Media that that they “won’t march with Uribismo” or because they were afraid of outbreaks of violence. Unlike previous protests against the mass killing of social leaders, Sunday’s protests failed to draw major crowds despite a major advertisement campaign by the government. The president has refused to continue to talk with the ELN, claiming that the 54-year-old rebel group is behind Thursday’s terrorist attack, the deadliest in 15 years. Ahead of the attack, polls indicated that most Colombians were in favor of the talks and widely rejected Duque. The president’s apparent attempts to use the terrorist attacks to reactivate armed conflict spurred many to stay home. Some centrist and leftist political leaders had urged to join the march in an attempt to unify the deeply divided country, but also failed to muster significant support.